I have been very busy tying – still – playing in the band, enjoying summer despite very little fishing. And I am still backed up on my fly orders. Just about when I seem to close in on getting caught up, I get a slew of new orders and I’m right behind schedule again. Perhaps being behind on my orders is the new norm. I did recently send in the reservation form for the International Fly Tying Symposium in New Jersey in November, looking ahead to that. Be here before you know it. I’m still trying to get caught up on some older tying projects as well. It has been interesting over these years; all the fly tying I have done, the various types and style of flies I have produced. Recently I received an unusual request, and it all came about in a very interesting and fascinating way. A man from Australia posted a comment on the topic about The Angler’s Nook and The Liar’s Bench, the shop on the Battenkill River in New York. Seems the man from Australia hosted an American soldier serving in Viet Nam in 1970, for a little R & R trout fishing time in Australia. This particular soldier turned out to be none other than Richard Entwhistle, son of the owner of The Angler’s Nook. My Aussie friend, Kevin Laughton, sent me a pic of Richard sitting at his kitchen table in 1970, with a mess of trout. And that’s only part of that story. I don’t know how many of you have followed that topic and comment thread, but there have been several folks over the past year who found that post, commented, and have provided a wealth of additional information. The same thing has happened on my Carson Lake Special Wet Fly topic; feel free to check that out, and read through the thirty-eight comments it has generated. Lots of fascinating information has come forth on that fly, history, originator, and I even received a photo of a penciled drawing on the fly and instructions on how to tie it. Must be at least fifty years old. Now to the title of this post: Barramundi! Kevin Laughton has requested me to tie him a couple large flies for these big fish. They live in some lakes in Australia, Queensland, near the Tropic of Capricorn, so the weather is hot at times. These are big predatory fish, and I get to make up a couple “predator flies” – see there, even an old classic fly tier can get in on the new trends, 😉 for him to try out in October. Below is a photo of Kevin with a 40 lb. Barramundi. 40 lb. 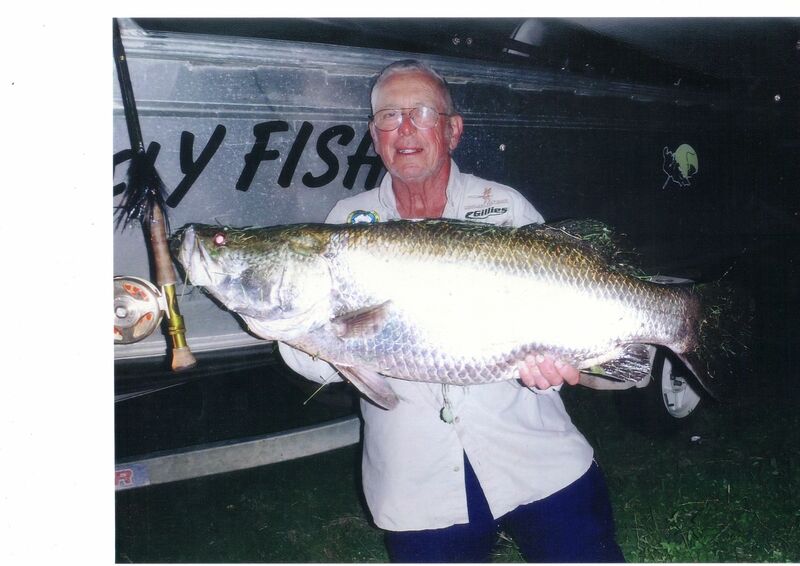 Barramundi, caught in Lake Awonga, Queensland, Australia, by Kevin Laughton, holding the trophy. I’ll get to try my hand at creating a couple large, original “Predator Flies” for these big fish. Thanks for the contact, information on Richard Entwhistle, and for the chance to tie Barramundi flies, Kevin! Cheers! This entry was posted in Fish Stories and Other Tales, Fishing Photos and tagged Barramundi, Lake Awongo, Queensland Australia, The Angler's Nook, The Liar's Bench. On another note, discovered Barramundi a couple months ago…LOVE it!!!! Just bought more the other day!! So , as an interesting aside, I am Richard Norman, and Rick is Richard Norman Entwistle, we have joked about that over the years. His Dad, Ralph, was always good to me as a kid. Showed me a neat trick to tie a blood knot. Still use it. Saved me millions I would guess on leaders, and he gave me the tippet spool. That would have been back in the late sixties. Would have liked to meet Kevin, but am about a year to young. Maybe I’ll get over there some day. Really good to see you back on line, DB. I’ll be very much interested to see what you come up with as a lure for those barramundi. From the looks of the one on the photo, a Size #16 emerger isn’t going to hack it. How’d you make out? Hope to get a glimpse at the Barramundi flies Don! Nice to hear from you! As yet I have not tied them…better get busy! 😉 I’ll post pics when I do…thanks for your comment!